When you have to withdraw money at an overseas cash machine, you may be presented with the option to make the withdrawal with conversion or without conversion. The option to withdraw with conversion – i.e. 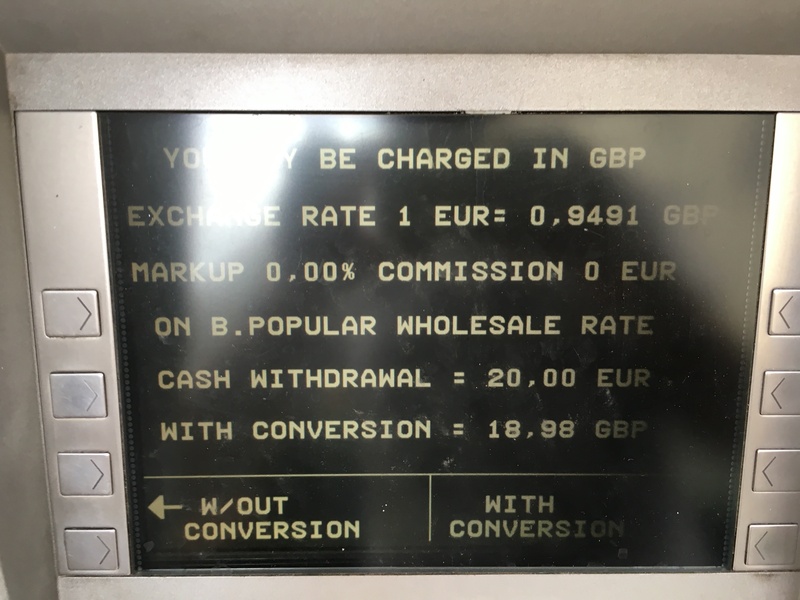 letting the bank do the currency conversion – may be worded in a way that makes it seem like a better choice, with no mark-up or commission, as you can see in the photo below. However, we have tested both options, and we recommend that you choose the option to withdraw without conversion. Recently, while on holiday in Spain, we tried both options, withdrawing £20 from the same bank. The “without conversion” option costed £17.81, while the “with conversion” option ended up costing us £18.98. The bank added a hidden fee of £1.17 – something they didn't mention along with advertising their 0% mark-up and 0% commission! Just something we thought you should be aware in the future. If you're given the choice, always choose to withdraw money without conversion.